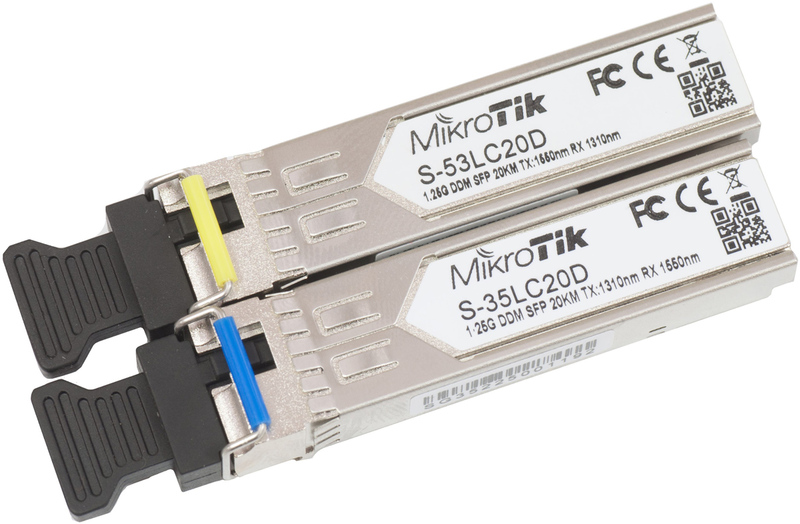 The Mikrotik S-35/53LC20D is a pair of SFP transceivers. The S-35LC20D is a 1.25G Single Mode optical SFP module with a LC connector, T1310nm/R1550nm, which works for connections up to 20km and supports DDM. The S-53LC20D is a 1.25G Single Mode optical SFP transeiver with an LC connector,T1550nm/R1310nm, which works for connections up to 20km and supports DDM. Units have been tested and are compatible with RB260GS, RB2011LS, RB2011LS-IN, RB2011UAS-IN, RB2011UAS-RM, RB2011UAS-2HnD, RB2011UAS-2HnD-IN CCR1036-12G-4S. They are compatible with non-MikroTik SFP devices as well.